Earrings 100% hand made. Copper, enamel, resin&paper. 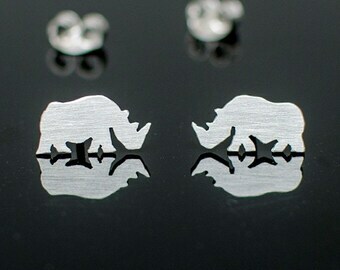 Rhino hand cut 925 sterling silver stud earrings. Animal lovers gift. Tiny rhino studs. 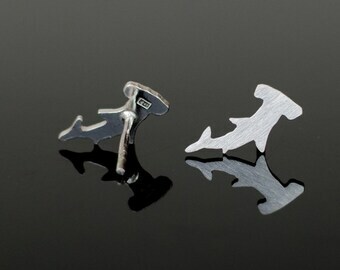 Sharks hand cut 925 sterling silver stud earrings. Animal lovers gift. Tiny hammer shark studs. 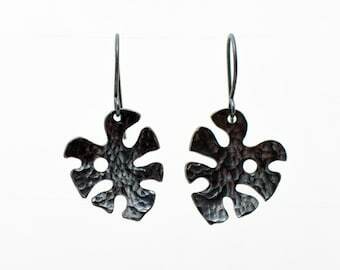 Tiny Monstera Deliciosa earrings made of hammered and oxidized nickel silver. Small earrings. Elegant earrings. Black earrings. Announcement Free shipping when you buy 3 items. Free shipping when you buy 3 items. Enamel africa rasta colors earrings. Red, yellow, green enamel on copper. Enamel earrings. Rasta earrings. Africa earrings. 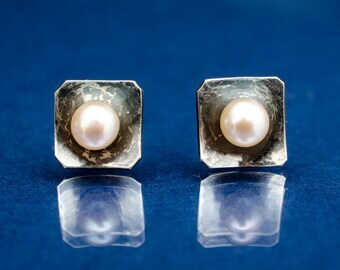 Tiny square shaped earrings made of oxidized silver with white freshwater pearls. Pearls studs. Silver pearls earrings. Tiny square shaped earrings made of oxidized silver with black freshwater pearls. Pearls studs. Silver pearls earrings. 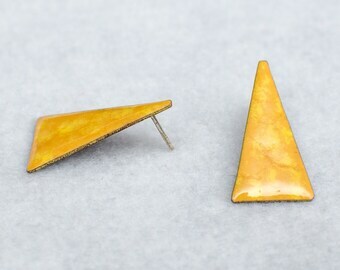 Yellow triangular enamel stud earrings - "cold" enamel on copper. Yellow earrings. Stud earrings. Yellow studs. Tiny concave square shaped earrings made of hammered and oxidized silver with freshwater pearls. Pearls studs. Silver pearls earrings. 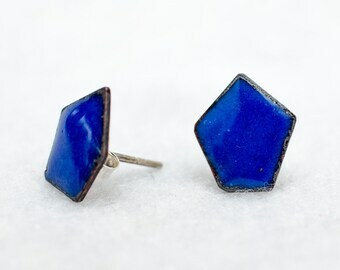 Blue penatgon enamel stud earrings - dark blue - enamel on copper. Blue earrings. Stud earrings. Blue studs. Earrings banana leaf. Big earrings of hammered brass. 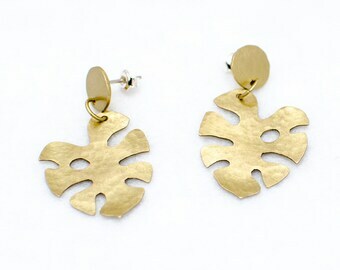 Tropical leaves earrings. Golden earrings. 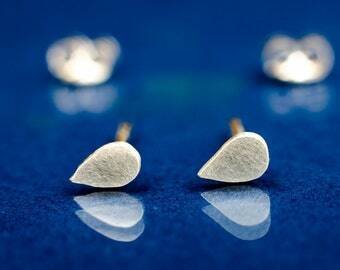 Leaves earrings. Tropical earrings. Big earrings of hammered brass. Tropical leaf earrings. Golden earrings. Hammered brass leaf earrings. Tropical earrings. Aralia earrings. 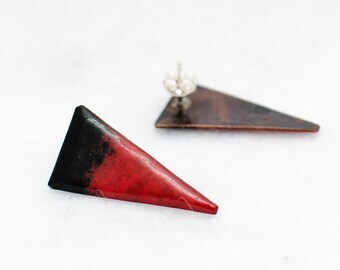 Triangular enamel stud earrings -red & black - "cold" enamel on copper. Red earrings with black elements. Stud earrings. Anarchy earrings. Monstera stud earrings of hammered brass. Tropical leaf studs. 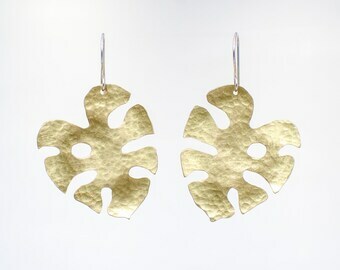 Golden monstera earrings. 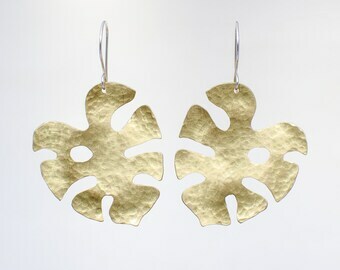 Hammered brass monstera leaf earrings. For her. Classic geometric stud earrings made of brushed brass. Golden earrings. Big earrings. Geometric earrings. 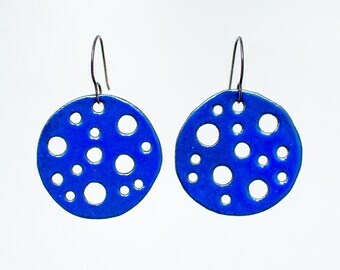 Enamel blue round earrings with holes. Blue enamel on copper. 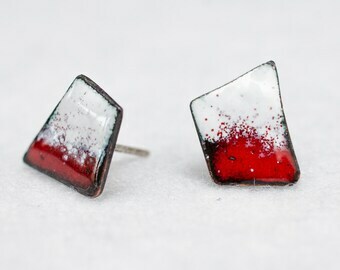 Enamel earrings. Blue earrings. 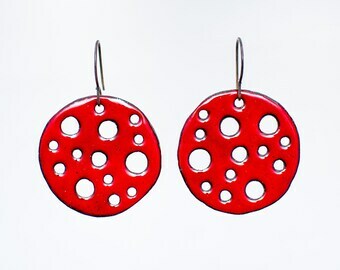 Enamel red round earrings with holes. Red enamel on copper. Enamel earrings. Red earrings. Geometric irregular enameled earrings - red, enamel on copper. 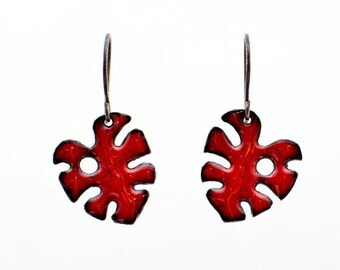 Red enamel earrings. Best red gift for her. Long geometric earrings. 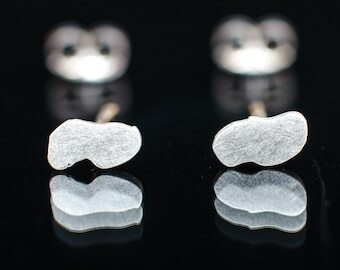 Cute irregular 925 sterling silver stud earrings. Hand cut tiny irregular studs. Geometry lovers gift. Cute silver fan 925 sterling silver stud earrings. Hand cut tiny clover studs. Geometry lovers gift. Clover earrings. Fan earrings. 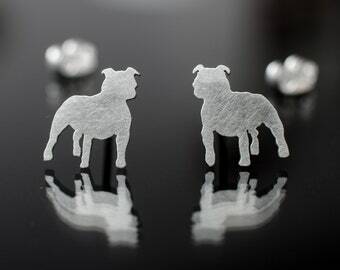 Cute Staffordshire Bull Terrier 925 sterling silver stud earrings. Hand cut tiny dog studs. Animal lovers gift. Staffie lovers. Cute rectangle 925 sterling silver stud earrings. Hand cut hammered tiny bar studs. Geometry lovers gift. Cute water drop 925 sterling silver stud earrings. Hand cut tiny drop studs. Geometry lovers gift. Belin was wonderful to work with, and made these beautiful earrings with a modification on a design at my request. The work was done quickly, shipped right away, and Belin even checked in when they arrived. Great Etsy artist! 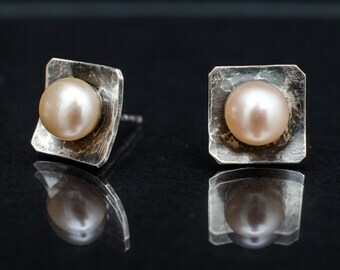 Tiny concave square shaped earrings made of hammered and oxidized silver with freshwater white pearls. Cute white French Bulldog 925 sterling silver stud earrings. Hand cut tiny dog studs. Animal lovers gift. As expected, these earrings are adorable! Very well made and unique. They also look great on-- the deer hooves come right to the bottom of my earlobe. Shipped quickly with good communication from Belin. I was delighted when I opened the package and saw that the earrings came in a little environmentally friendly cardboard box stamped with the seller's logo and neatly wrapped in green crepe paper. Perfect for gifting. Thank you!!! 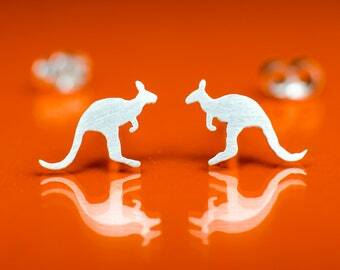 Fawns hand cut 925 sterling silver stud earrings. Animal lovers gift. Tiny deer studs. For purposes of EU data protection law, I, Belin Czechowicz, am the data controller of your personal information. If you have any questions or concerns, you may contact me at stfur@stfur.pl. Most of my works are water resistant but it is recommended that you avoid contact with water, hair care products and perfume. It's possible in Brussels (Belgium) and Warsaw (Poland). Please contact me before buying.